In order to understand and talk about the Elements of Dance, we need to first be able to describe what we see and hear when we watch a video or a live presentation of dance. Sounds simple, right? But describing something without judgment or personal opinion is hard. People quickly form opinions about a new experience and students may jump right away to a personal reaction or a perceived meaning. Learning to slow down and simply describe what we notice is the first step in examining dance or even in examining any other experience or phenomenon. Pure description starts with the senses - what do you see and hear when watching the videos and images on this web site? In live experiences, you may also even notice smells or tastes or tactile and bodily experiences. Although there are several ways to think about the elements of dance, this graphic organizer shows how these elements are identified in the Minnesota Arts Standards. Refer to this page as you begin describing and analyzing the dances. 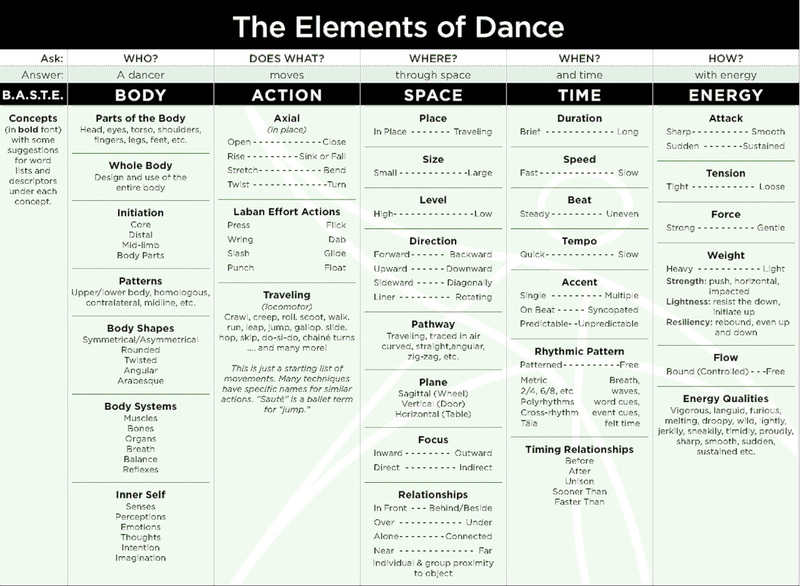 You may also click on this link to download The Elements of Dance for handouts or display. A project of the Perpich Center for Arts Education in partnership with University of MN Dance Program including support from University Research Opportunity Program (UROP).